By Robert Roy Britt — A new development of 170 homes is in the planning stages on a parcel of private land near the current Circle Mountain development on the west side of Anthem. The empty plot, northwest of the Post Office, straddles New River. Some Anthem residents are already voicing opposition. 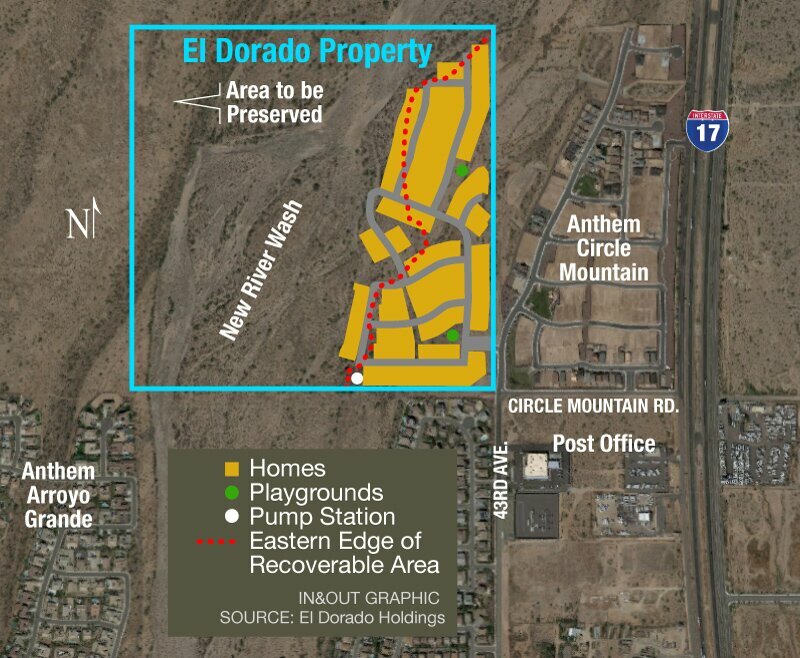 The developer, El Dorado Holdings in Scottsdale, plans one- and two-story homes similar to those in Anthem, said Linda Cheney, the company’s vice president. The project’s proposed density—3.1 homes per acre—is common in North Phoenix and below the max allowable of 5.5 per acre. Two small parks with grass and playgrounds are planned. A homebuilder has not been announced. In a letter dated Jan. 11, El Dorado invited nearby neighbors to a Jan. 24 meeting to discuss the proposal. Much of the 160-acre parcel is in the river, leaving it undevelopable. A rezoning request has been filed with the City of Phoenix, to change 55 east-side acres from S-1 (ranch or farm residence) to R1-6 (single-family residential). Cheney told In&Out that El Dorado is promising to set aside the developable portion of the property west of the river, which is zoned for one-acre-lot minimums, for preservation. “We would either donate the balance of the property to the city of Phoenix to be preserved or put it in the HOA with restriction that it could not be developed,” she said. The proposal includes filling in some of the land nearest the river to raise it above the floodplain, Cheney explained. This “recoverable area” would have to be approved by FEMA, she said. A privately-owned lift station at the southwest corner of the development would pump sewage uphill to the city’s lines on 43rd Avenue. Some residents on Anthem’s west side are already upset by the proposal. Bruce Sarver, who lives along Yoosooni Drive immediately south of the proposed development, purchased his home five years ago for the unobstructed views of the desert and the mountains to the North. He told In&Out that he was told the site was undevelopable, as it was too close to the wash.
Jeff Huff and his family bought a premium view lot in Anthem Circle Mountain to “build our dream home,” he said. His lot would look upon rooftops if the new development is built. “We were under the impression that no one could ever build behind our house,” said Huff, a realtor with Prickett Realty. “If we had prior knowledge of this we may have looked elsewhere.” He said several of his neighbors are concerned, and they plan to attend the Jan. 24 meeting. The homes would not be part of Anthem, Cheney said. This means homeowners would not have rightful access to Anthem’s amenities. The project would need to go before the Rio Vista Planning Committee, an advisory group to the city, and then before the Phoenix Planning Commission before any final approval by city council. No timeline has been set for these meetings. Karen Goveia contributed to this story. The view from Anthem the Circle Mountain neighborhood, looking Southwest, shows Anthem homes off 43rd Avenue to the left, Arroyo Grande in the distance. Homes would go in the foreground. This article was first published on North Phoenix News.